Use of the term conscious – as applied to business – only emerged in mainstream thinking shortly before the recession got underway. Business leaders like Anita Roddick (The Body Shop) and writer-thinkers such as Paul Hawken, author of Natural Capitalism paved the way for the the new values-based approach to business. Subsequently, books such as Patricia Aburdene’s Megatrends 2010: The Rise of Conscious Capitalism and Fred Kofman’s Conscious Business: How to Build Value Through Your Values have been cited as influential in the business community. During the same period there has been a substantial shift in the approach to Corporate Social Responsibility. Companies initially applied CSR as an optional extra – adding philanthropic projects to demonstrate a degree of responsibility but not really examining and changing their fundamental approach to the utilisation of resources and people in pursuit of profit. As will be described elsewhere, the term CSR is fast disappearing as the business commnuity grapples with the notion that all commerce is about relationships between people and is inherently social in nature — see FutureLab’s short video here. If there was a reluctance by mainstream business to embrace concepts associated with responsibility, sustainability, or even “green,” it was because they lacked conviction that the market for products and services created by conscious companies was large enough. This feature applied particularly to tourism where responsible/eco/green/sustainable tourism enthusiasts were perceived as a minority fringe. The primary source of research that did identify a customer segment attracted to green, organic, natural products and lifestyles had an unfortunate acronym LOHAS (Lifestyles of Health & Sustainability) that reinforced the fringe element. As we slowly climb out of the deepest recession to hit many economies since the 1930s, it has become apparent that a major shift in consumer attitudes and values has taken place that is changing their behaviour “for good” – literally and metaphorically.Conscious consumers are no longer the minority. 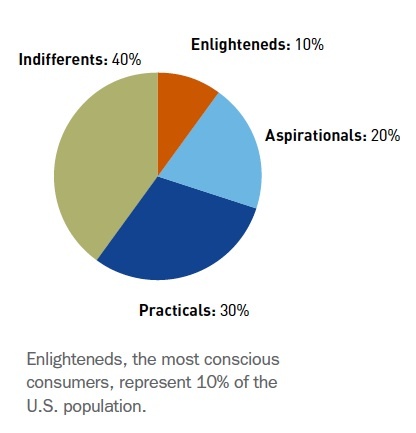 BBMG, whose report on the Conscious Consumer is summarized here, suggest that they comprise 60% of the total population. Even if this percentage may be a little inflated, there is no doubt that thanks to their affluence, education and proclivity for community, what conscious consumers do today will shape what the mainstream does tomorrow. We’ve looked at five major resource sources, all undertaken independently of one another, some global, others national, that show a remarkable degree of consistency. While the BBMG study is the only one that specifically applies the adjective “conscious” to the so-called New Consumer (BBMG), all describe how a more considered, mindlful, cautious approach to consumption has evolved during the recession and is unlikely to wane should the economy pick up speed.